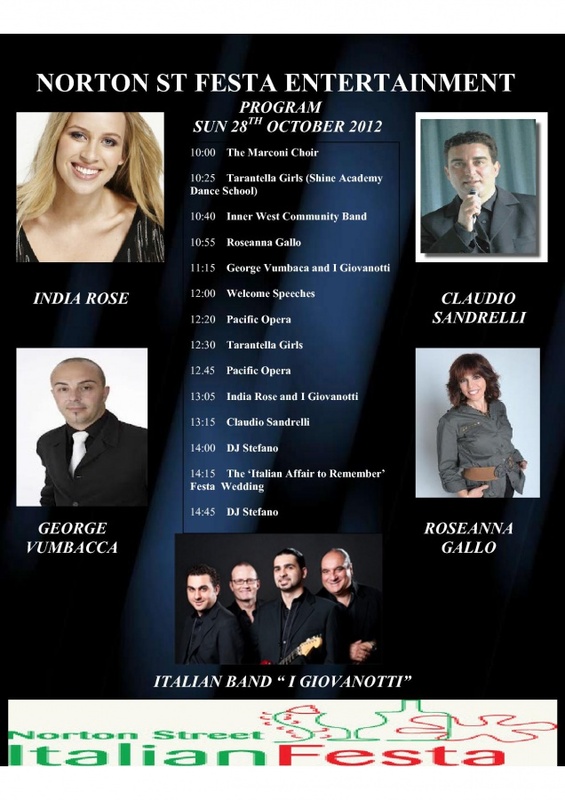 commented on "NORTON STREET FESTA SUNDAY 28TH OCTOBER 2012 ..."
Plenty of local talent is set to hit the Main Stage on Festa Day from traditional Italian dancers to Ciao's very own local supermodels! Festa is always full of colour, music and tonnes of party atmosphere, and this year will be no different with The Marconi Choir kicking things off at 10am, putting on an unmissable musical performance to be followed by Tarantella Dancers and the Inner West Community Band. Younger festivalgoers are also sure to enjoy DJ Stefano's upbeat tunes playing at regular intervals throughout the day from 2pm. Joining these other acts is 'The Voice of Naples,' Claudio Sandrelli, who has been trained by some of the best singers in Italy and only recently returned from a tour there. Claudio sings traditional and classical Neapolitan songs by greats such as Mario Merola, and will be backed on stage by I Giovanotti Band. Roseanna Gallo, one of the elite singers currently performing in the hit stage show "Serenading '50s, '60s, '70s," is looking forward to entertaining the masses on Festa Day. The charismatic Italian singer/songwriter has been the musical director for various Carols by Candlelight and other local events and her original composition of the 'Migrant Song' has been played regularly on 90.3FM Italia Mia station and Rete Italia. Roseanna loves getting her audience involved and is sure to have everyone at festa dancing along Norton Street.